Welcome to The Not Old Better Show, I’m host Paul Vogelzang, and this is episode 340. Today’s show is brought to you by GlutaDose. 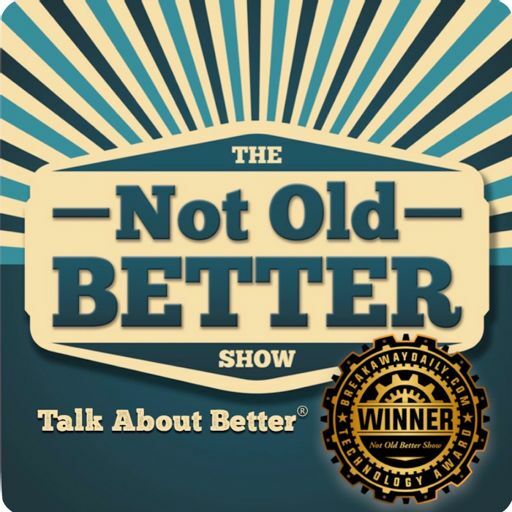 Welcome to the Not Old Better Show. I’m Paul Vogelzang and this is episode #337. Welcome to The Not Old Better Show, I’m host Paul Vogelzang, and this is episode 316, today’s show is brought to you by Simple Habit. Welcome to the Not Old Better Show, I’m your host Paul Vogelzang, and this is episode number 311. Today’s show is brought to you by Blinkist. Welcome to The Not Old Better Show, I’m Paul Vogelzang and this is episode number 300. #271 US - Russia Future Relations? US - Russia Future Relations? #255 Rome Vs. America: Crumbled & Crumbling? Rome Vs. America: Crumbled & Crumbling? #251 Go4Life Month - September 1! Go4Life Month - September 1! Introducing Inside Jaws! New Show Debuts Here! What’s worse than losing your life? Losing a few bucks, apparently. Business Buildout series, Gig Economy, Working Past 50, Your Next Avenue Podcast! #217 Introducing American Innovations! New Show Debuts Here! Introducing American Innovations! New Show Debuts Here! Paul Steinberg, MD, Reads from His Book, "A Salamander's Tale." #212 Cool New Things DNA Testing Does for Us! #205 Author John Butman New World, Inc. Author John Butman New World, Inc.
Do you fear it’s too late to make change? Welcome to The Not Old Better Show, I’m host Paul Vogelzang, and this is episode 197. #193 Sabrena Jo, Exercise Expert, ACE, RECOVERY! Part 3, Thomas MacEntee: RootsTech 2018, On Your Calendar! #180 Do You Know Your Family History Stories? Do You Know Your Family History Stories? #176 Guide to the Periodic Tables - What is Matter, and Why it Matters? Guide to the Periodic Tables - What is Matter, and Why it Matters? Check out the latest tips on staying fit, fast and focused over 50! DAY 3: FREE eBook, now Today, along with new video! Today’s tip on VO work is about getting work. When a Russian rocket lofted Sputnik 1 into orbit on October 4, 1957, the worldwide reaction was a mixture of awe and apprehension. The Space Age—and the Space Race—had begun. #127 Jean Twenge, Ph.D, Author, iGen: Super Connected Kids Are Less Happy. Why? Jean Twenge, Ph.D, Author, iGen: Super Connected Kids Are Less Happy. Why? #123 Jumping with the US ARMY Golden Knights! Jumping with the US ARMY Golden Knights! 13500 Ft. Above Earth, That's Me Up There...Jumping from Plane! #121 Jackson Mann, VIBES CEO, on Shark Tank! Jackson Mann, VIBES CEO, on Shark Tank! Here's How To Get Your Smithsonian Discount! Spend a night at the National Museum of American History, Air & Space, and Natural History! #101 Scott Turow Interview: "Testimony"
#100 Can You Control How You're Aging? Ernest Hemingway: Author & SPY! #87 Smithsonian Associates Interview, Diane Rehm "On My Own"
Smithsonian Associates Interview, Diane Rehm "On My Own"
#86 Smithsonian Associates Interview, Stef Woods, "Collapsing House of Cards"
#85 New Nintendo Switch Launch: What You Need To Know Now! New Nintendo Switch Launch: What You Need To Know Now! New Movie Release Friday, April 3, 2017, "The Shack" Must See! Author, Brad Gooch, "Rumi's Secret: The Life of the Sufi Poet of Love"
#78 National Love Your Pet Day, February 20. 2017 National Love Your Pet Day, February 20. Join Us as We Celebrate "Yarn Yoshi" & "Yarn Poochy," and Hasbro's New JoyForAll Golden Retriever. #72 Happy New Year! Gretchen Vogelzang & me: What's NEXT? Happy New Year! Gretchen Vogelzang & me: What's NEXT? What does Veterans Day mean to me, a son and an uncle of 2 family members in the military? #40 Mike Massimino, author, astronaut. "Spaceman: An Astronaut's Unlikely Journey to Unlock the Secrets of the Universe." #36 Author Mike Massimino, "Spaceman,"
The Not Old - Better Show Interview series: Chef Kwame Onwuachi, Top Chef, & Guest Lecturer, Smithsonian Associates. The Not Old Better Show Interview Series: Weird Al Yankovic Concert. SMITHSONIAN ASSOCIATES FALL COURSES, INTERVIEW WITH REBECCA ROBERTS, PROGRAM COORDINATOR, EP 2. SMITHSONIAN ASSOCIATES FALL COURSES, INTERVIEW WITH REBECCA ROBERTS, PROGRAM COORDINATOR, EP 1. INTERVIEW WITH AUTHOR CAPTAIN CHESLEY "SULLY" SULLENBERGER, OF THE BOOK, "HIGHEST DUTY," & SUBJECT OF THE FILM, "SULLY," STARRING TOM HANKS. The Not Old Better Show, "Movies for Adults," Movie Review: "Jason Bourne." #21 Happy Bday Mick Jagger, a new dad! Happy Bday Mick Jagger, a new dad! It’s a phenomenon, actually. The new game, Pokemon Go, literally has everyone up, off the couch, out of their seats, and playing this game. I’m talking EVERYONE. LED ZEPPELIN ON TRIAL FOR CHORD THEFT: WHO OWNS THE CHORDS??? Welcome to The Not Old Better Show, and I’m your host, Paul Vogelzang. #8 Interview with New Yorker Magazine cartoonist Roz Chast, author of "Can't We Talk About Something More Pleasant?" Interview with New Yorker Magazine cartoonist, Roz Chast author of "Can't We Talk About Something More Pleasant?" #7 Interview with Dan Lyons, author of "Disrupted: My Misadventure in the Start-Up Bubble"
Interview with Dan Lyons, author of "Disrupted: My Misadventure in the Start-Up Bubble"
#6 Interview with Dusty Wright, singer, songwriter, author, artist, content creator. INTERVIEW WITH DUSTY WRIGHT, SINGER, SONGWRITER, COMPOSER, AUTHOR, PIONEER AND BRILLIANT ARTIST. #2 "Exit" Interviews from the lobby... Eddie The Eagle. EXIT INTERVIEWS FROM THE LOBBY, FOLLOWING THE MOVIE “EDDIE THE EAGLE." INTERVIEW WITH “EDDIE THE EAGLE,”MICHAEL EDWARDS. THE 20TH CENTURY FOX FILM, "EDDIE THE EAGLE" COMING SOON, RELEASE DATE: 2/26/2016.